Need more information about booking Home 7498832 ? penthouse with a beautiful terrace, a true unlimited free WiFi access, air conditioning heating, TV and cable "satellite channel", a large living room, a nice room with plenty of storage . 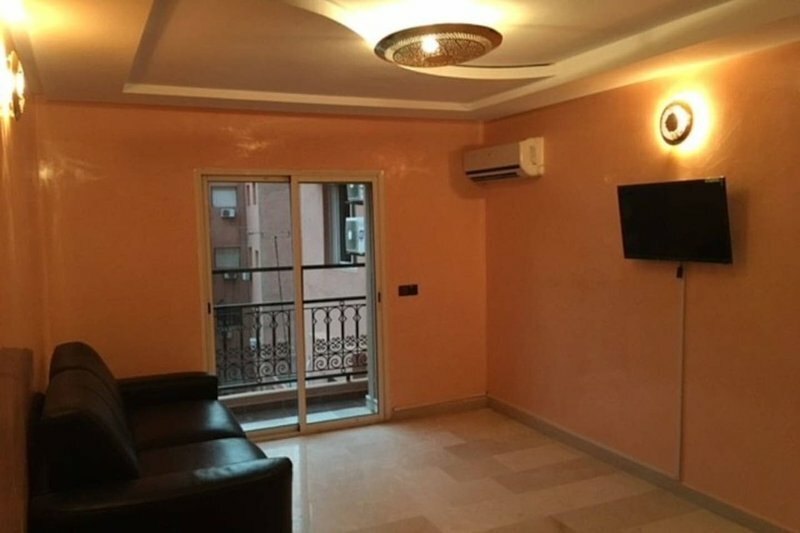 In the center of Gueliz 100 meters from the 'Plaza Guéliz' and its luxury boutiques, Eden Square, Mc Donald's .. this apartment will seduce you with its calm and beautiful terrace. You are in the center of Marrakech, close to restaurants, cafes, cinema, shops, shopping center, the cultural places (instead of Djamaâ Elfna, the souks of the medina a 10min walk. Thank you to respect the place and leave it as clean as you found it. if you smoke (if) it is allowed only on the terrace, strictly forbidden to smoke inside the apartment. Owner's reply: Thank you for your opinion, you are welcome when you want, it was a pleasure to meet you. You can get in touch with Sanaâ (the owner) through the contact form on this page. Send Sanaâ (the owner) an email through the contact form on this page. Alternatively, if there’s a phone number on this page, you can call them. How do I contact Sanaâ (the owner)? If you’ve already booked, go to Manage your holiday booking to view Sanaâ the owner's contact details or send them a message. Or send Sanaâ (the owner) an enquiry through the Contact the owner/manager form if you’d like a quote or more info first. When you pay online through the Book your stay form, a booking request is sent to Sanaâ (the owner). You’ll find out within 24 hours whether they’ve accepted - no money will leave your account before then. You can also request a quote from Sanaâ (the owner) through the contact form. The owner will email you the total cost for your dates and a link to book and pay online. Use the Book your stay form to pay provisionally online. You can pay by credit/debit card or PayPal. Sanaâ (the owner) will have 24 hours to accept the booking and no money will leave your account before then. Why can't I call Sanaâ (the owner) before booking? You’ll need to contact Sanaâ (the owner) to do this. Send them a message in Manage your holiday booking or through the contact form on this page. You can request to change the dates or number of people on your booking via the Manage your holiday booking page. To change your holiday dates use the Edit booking button. If you need to change the number of guests staying then send Sanaâ (the owner) a message. If Sanaâ (the owner) agrees, they’ll send you a revised quote outlining the changes. You can review and accept/decline this from the Manage your holiday booking page. You’ll have 48 hours to take action before the revised quote expires. Apartment Gueliz Centre Free Wifi city.